This is Vicky Adler-Modry, Mr. Manka's Executive Assistant. 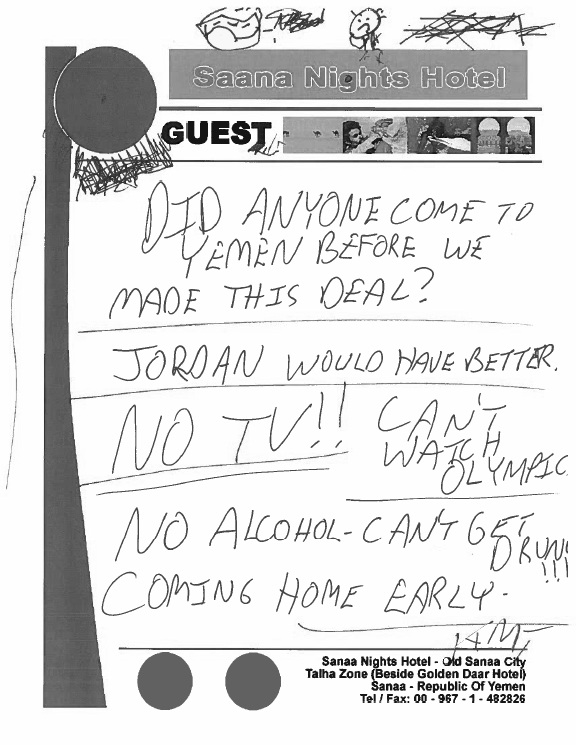 I received a fax from him this morning from the Sanaa Nights Hotel in San'a, Yemen. As you may have read in yesterday's blog, he was in Yemen for the groundbreaking ceremony of the new Manka Fun Park Yemen. He did not seem to pleased with the arrangements over there and is coming back early. "Did anyone come to Yemen before we made this deal? Jordan would have (??) better. No TV!! Can't watch Olympics. No Alcohol - can't get DRUNK!!! Coming home early. KMJ"
This is all the information I have at the moment. I don't have his arrival time in Los Angeles. The jet is still on the ground in San'a, Yemen. Please do not call the office for updates. I will update you as I get any new information. Listed below are links to blogs that reference this entry: Khan Manka, Jr. Is Leaving Yemen Early. Ooh, the Saana Nights Hotel? I think I'm glad I didn't go. They didn't have a Four Seasons? For tourists, Jordan would have been a better place to build a theme park. I don't know anyone who has been to Yemen... or plans to go to Yemen. No alcohol in Yemen? What is the world coming to?! I wouldn't worry, sir. I think the park will be great. Yemen needs something like this to draw tourists. We will build it and they will come! My question is why was he staying at a hotel frequented by backpackers? He would have had satellite channels and booze if he'd stayed at the Movenpick. A man of your stature, Mr. Manka, should not be staying in a backpackers hotel. Someone dropped the ball! Mr. Manka is back in Los Angeles. He doesn't want to receive any communication at all. No phone calls, no faxes, no emails. Movenpick doesn't sound so good either. I should say that mankabros.com has lots of interesting information. Looks like the author did a good job. I will be coming back to mankabros.com for new information. Thank you.